Europe’s economy as a whole and individual European economies have been sort of not good since the global financial crisis. So we decided to take a deeper look at how Europeans feel about this. Using data from the autumn 2015 Eurobarometer report, for which fieldwork was conducted in November 2015, we put together a chart showing Europeans’ perceptions of the EU economy as a whole compared to their own countries’ economies. Respondents from major developed market economies, including Germany, the UK, and the Netherlands, all were more likely to say that their national economy is “good.” By comparison, respondents from emerging market European countries like Croatia, Romania, and Lithuania were less likely to say that their national economy was good. But things were a bit different for respondents’ thoughts on the European Union economy. Those in emerging market economies (again, Croatia, Romania, etc.) were more likely to say that the EU economy is “good.” Meanwhile, respondents from countries like Germany, the UK, and the Netherlands generally gave less positive assessments of the EU compared to their own economies. This split is particularly interesting with respect to labour markets. 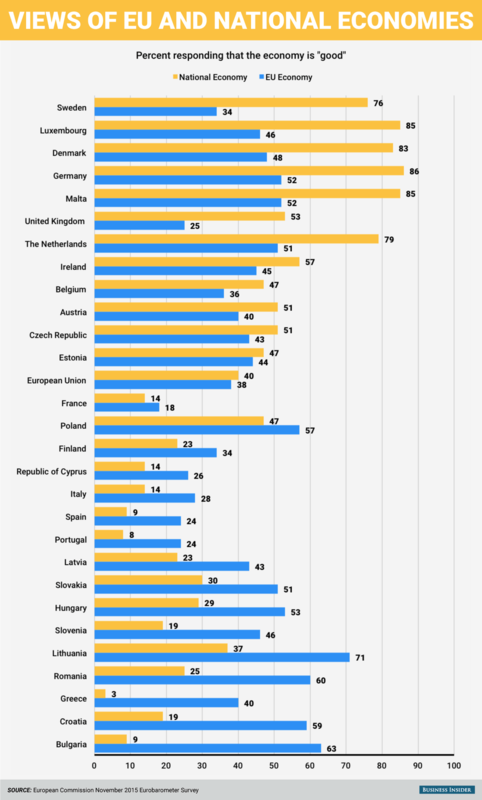 It’s notable that several emerging European countries like Bulgaria and Croatia that have more positive views of the EU overall also have insanely high unemployment rates (and even higher youth unemployment rates — at 29.7% and a whopping 49.5%, respectively). And, young people in these countries tend to leave in order to find better opportunities in other parts of the EU (including the UK). Meanwhile, on the flip side, countries like Germany and the UK, which were less likely to give a more positive of assessment of the EU compared to their own countries, have much lower unemployment rates (and youth unemployment rates) and are often the dream destination point for unemployed people from other nations. Although, of course, we should note that this is just one of the many economic problems in the European Union and certainly not the sole driver of any of these sentiments. We arranged the countries in terms of per cent of respondents saying that their own national economy was “good” minus the per cent of respondents saying that the EU economy was good — from greatest to least. Check out the full chart below.